These days I find myself substituting rice with whole wheat, surrendering to the pre occupied notion that wheat is healthier than starchy polished rice! Be them, idlies or upma I find comfortable enough with the variety of easily available broken whole wheat grains in the market. The recipe and method for this one is entirely different and a bit elaborate but you can always preserve the masala coated veggies which stays well in your chiller even for a week, until you can mix up and heat it with rice of broken wheat to make the meal! 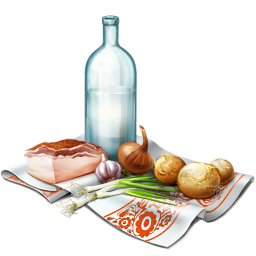 Cook vegetables in a little water and salt until they are half cooked but firm. Take care not to cook them mushy. Grind the ingredients mentioned above to a smooth paste adding minimum water. Keep aside. Heat oil in a non-stick kadai and sauté onions till golden brown. Throw in the diced tomatoes and sauté until cooked. Stir in the masala and sauté till the raw flavour disappears. Drizzle few more drops of oil if it seems too dry coz the masala needs a bit of extra oil to get sautéed. Turn the flame to minimum when you are done with this part and stir in the vegetables gently so as to coat the masala. Add salt and turn gently to combine further. Switch off. you can pressure cook adding the same amount of water( slightly lesser than 2 parts) until 3 whistles. Whichever way you opt, see to it the grains are firm and cooked right...not overly done/mushy. 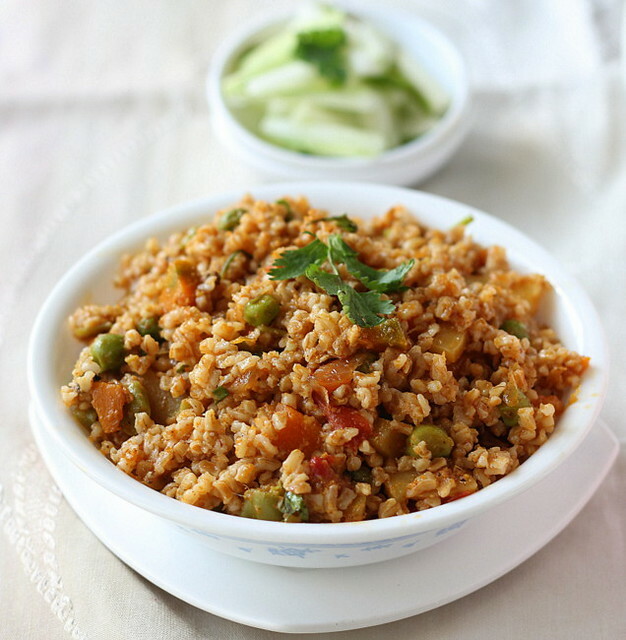 Combine the cooled cooked broken wheat grains with the masala in the pan stirring gently to combine. Check salt. Heat up the whole meal in low fire stirring gently for a couple of minutes before you serve. Enjoy the warm meal with onion or cucumber raitha. I make Vegetable biriyani this way with basmati. 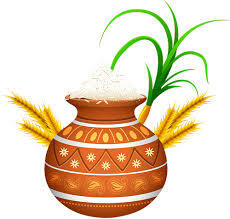 The broken wheat is just a substituion to rice as mentioned earlier. 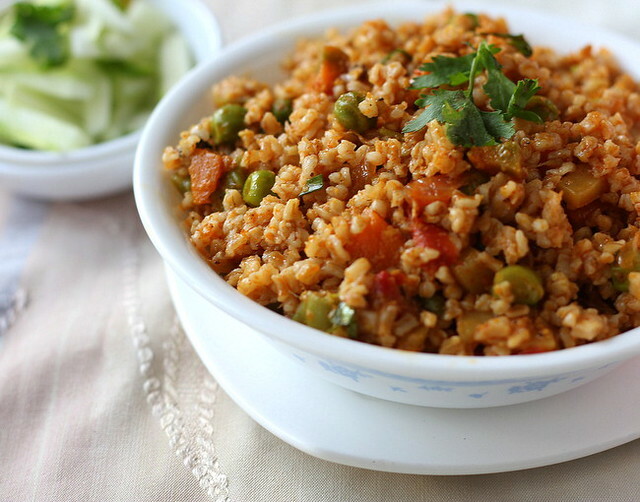 You can mix the gravy with rice as well and heat up to make the instant veg biriyani! As said above, you can always preserve the masala coated veggies which stays well in your chiller even for a week, until you can mix up and heat it with rice of broken wheat to make the meal! Since broken wheat is blander in taste and flavour when compared to basmati, I add 1/4 tsp of pepper powder and a tsp of sweet red chilly sauce towards the end while finishing the vegetables in the pan, for a the extra zing. Again, garnishing with a variety of herbs like mint and spring onion greens make the meal flavourful, as I had used in this one! 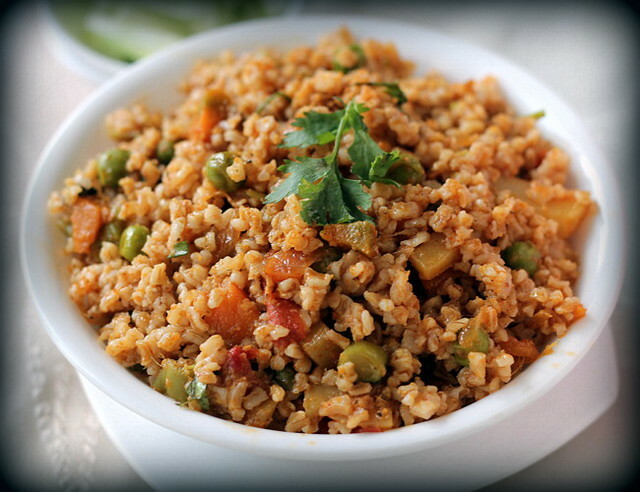 Beautiful clicks Bharathi, Its nice that you are substituting whole grains in place of rice. Will try your tomato biriyani soon. Really delish! !Love the use of broken wheat. Super photography and an equally good recipe. Looks delicious. 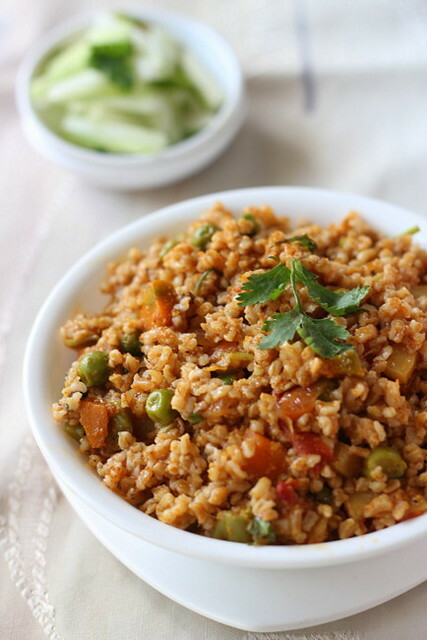 I've been wanting to try a mixed veg broken wheat upma,now this sounds like a better option! Tasty and healthy biryani !! brillant clicks !! Love the color of the biryani...and making a biryani with broken wheat is such a wonderful idea! Looks really tasty. Like the idea of storing spiced vegetables in the refrigerate for a quick meal. Wat a healthy,filling and definitely a satisfying briyani. I've been trying to avoid rice too and eating mostly wheat, I would love to know if thats actually good. Love this dish, a wonderful wholesome meal! Great clicks!! 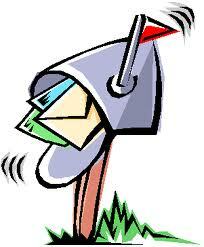 Heyy I sent you the code yesterday through the contact me tab on the top. Msg me if you got it. Yum... Bharati. Lovely pictures. Hope you are enjoying ur summer. I want to grab the whole bowl. The color is too nice Bar! 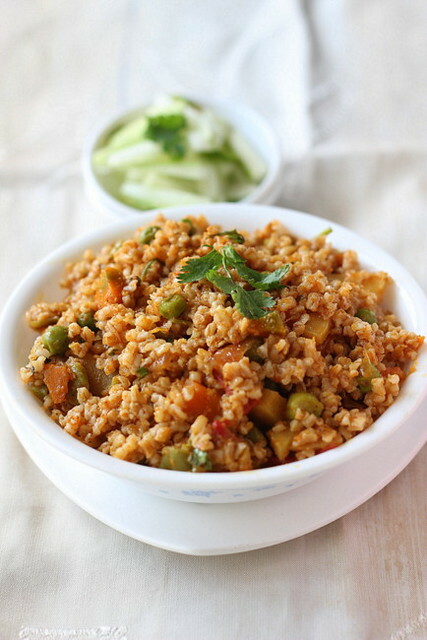 Hi Bharathy, I tried this with buckwheat instead of broken wheat, mainly, because buckwheat is low in calorie and is healthier. Came out great thanks for sharing! There aren't many buckwheat recipes and I was glad to find one that I can modify to suit buckwheat. Glad that it suited your taste, jayanthi :) I havent handledbuck wheat yet.Will post more in this one.. :) have on idly recipe too which you may modify in this variety.. hopefully!